Explanation: On July 4th, 2005, the Deep Impact spacecraft directed a probe to impact the nucleus of Comet Tempel 1. Still cruising through the solar system, earlier this year the robotic spacecraft looked back to record a series of images of its home world 31 million miles (50 million kilometers) away. In a sequence from top left to bottom right, these four frames from the video show a rotating Earth. They combine visible and near-infrared image data with enough resolution and contrast to see clouds, oceans, and continents. They also follow a remarkable transit of Earth by its large, natural satellite, the Moon. The Moon's orbital motion carries it across the field of view from left to right. 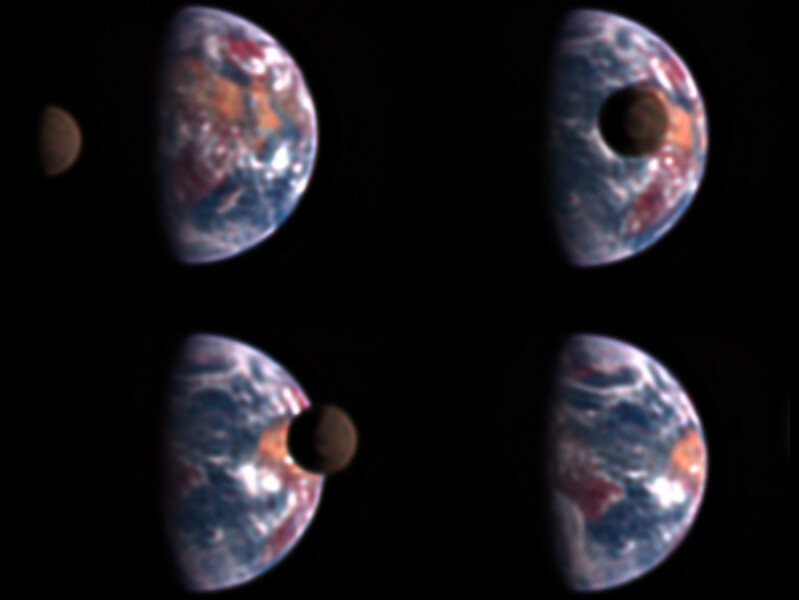 Imaging the Earth from this distant perspective allows astronomers to connect overall variations in brightness at different wavelengths with planetary features. The observations will aid in the search for earth-like planets in other solar systems.